Cut the tuna in to 1cm cubes. Mix together the soya sauce, balsamic vinegar and the fish sauce. Add the diced tuna and leave to marinate. Peel the avocadoes and cut the flesh in to small cubes. Wash, zest and juice the limes. Place the avocado, lime zest and juice in a blender. Add a little salt, the coriander leaves and a pinch of piment d'Espelette. Add the milk and then blitz until you have a light, fluffy purée. Place the tuna on to skewers and then roll in the sesame seeds to coat the fish. 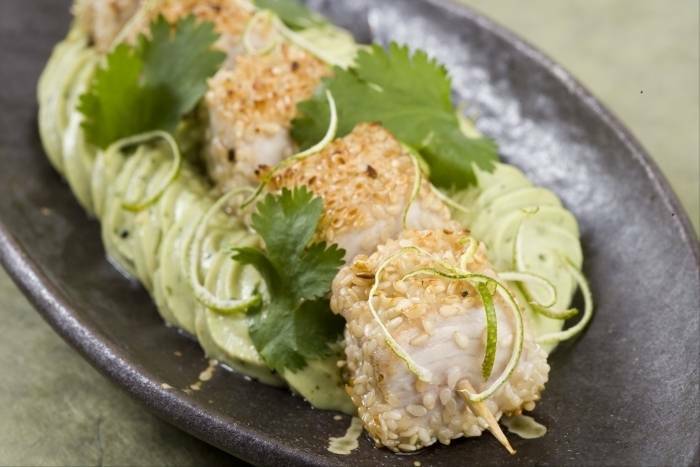 Serve the tuna skewers with the avocado purée.